Director of photography Ericson Core tackles Daredevil, a comic-book epic about a sightless superhero. Photos courtesy of 20th Century Fox. Like many popular superheroes, Daredevil makes his home in a graphically stylized version of New York City. After greenlighting a film version of the Marvel Comics series, however, 20th Century Fox cast an economically inclined eye northward. "The studios way of doing a film about Hells Kitchen, New York, was to take it to Canada," says Ericson Core, the films cinematographer. First Montreal was considered, and then Vancouver, "with the idea that we would also shoot exteriors on rooftops for a couple of weeks in Los Angeles, and maybe, if we were lucky, go to New York for a couple of establishing shots." That was the plan until Core and director Mark Steven Johnson scouted the historic district around downtown L.A.s Arcade Building, where they discovered "so many beautiful, old brick buildings and great rooftops to photograph," Core says. "Its very old Los Angeles, which can sell for New York. We realized we would never, ever be able to get that scale on stage  certainly not in Vancouver, where there really are no stages." 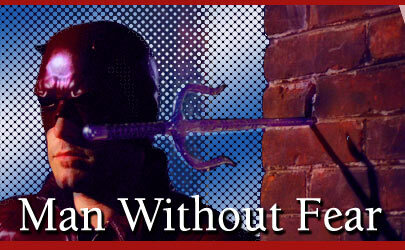 In addition, Ben Affleck, who portrays Daredevil and his alter ego, attorney Matt Murdock, had just filmed The Sum of All Fears in Canada, and he wasnt thrilled about the prospect of returning. "At Bens urging and our urging, we did something amazing: we got a large studio movie destined for Canada moved back to the United States," says Core. Downtown L.A. may not be New York, but it made for a much easier and more accessible location  and, particularly at rooftop level, it offered a sense of the moody, nighttime world so crucial to Daredevil. One reason for that style is that the superhero, created by Stan Lee and Bill Everett in 1964, happens to be blind. Of course, Murdock, whose condition is the result of a childhood accident involving radioactive waste, has a number of advantages to offset this disability; his other senses are acute and function as a sort of internal radar system. By day, Murdock defends criminals in the courtroom; by night, he dons a red-leather costume and mask and metes out vigilante justice to villains like Bullseye (Colin Farrell), an assassin who throws his weapons from afar, and Wilson Fisk (Michael Clarke Duncan), the towering Kingpin of crime. Rounding out the cast of characters is Elektra (Jennifer Garner), a martial-arts expert and femme fatale. Core was unfamiliar with Daredevil before he met Johnson, a screenwriter who was making his sophomore outing as a feature director, following 1998s Simon Birch. "There was no name recognition for me at all with Daredevil," the cinematographer admits. "I grew up in a family of painters, so I was looking at art books, not comic books. But the first thing Mark did was show me these incredible renderings of Daredevils world. After that, it was an easy sell." Johnson pursued Core for the project after seeing his work in such films as Payback and The Fast and the Furious (see AC May 01.) "He was interested in doing a dark, edgier comic-book movie, like The Crow, and I thrive on that sort of work," Core says. "Also, he was a little concerned about the action and chase sequences, and I had just finished The Fast and the Furious, which had a lot of that kind of material. He also wanted the feel of Payback, which has a bluish look that I created with Deluxes CCE process." The color and texture of Daredevils suit and mask, designed by costume designer James Acheson (Spider-Man), were key considerations. In the comic his attire is a vivid red, but the filmmakers eventually settled on a blood-maroon hue. "In general the color saturation of the red suit was less in the [dailies] than what we saw on set," Core says. "For that reason, more red had to be added to get the correct level onscreen. "One of the things I find so great about CCE is the way it limits color," he continues. "I also saw that in Marks conceptual drawings: the films world is stark, with a narrow window of color possibilities." However, the cinematographer had to contend with the fact that Kodak stocks dont easily accommodate such a palette. "Every color in the world reproduces itself on Kodak film, and quite vividly," he says. "The difficulty comes when you want just a particular slice from the pie of available colors. Its hard to do that on Kodak film; you can do all sorts of things to it, but the color still holds up." The cinematographer chose Vision 500T 5279 as his main stock because of "the great exposure latitude it offers, which was very important for all of our night-time work. Also, given that the exposure curve would ultimately get compressed into the limited range of CCE, it was important to get as much information on the negative as possible. The 500-speed film also creates a bit of grain, which added to the gritty feeling we wanted; that was further enhanced by the Super 35 [optical blow-up]." Core used Vision 250D 5246 to film day exteriors and interiors. "Its the best 5600°K-balanced film to match the exposure range and grain of 5279," he notes. Narrowing Daredevils color palette was one way to suggest the characters point of view without representing it literally. Cores other tactics involved lighting and composition, and he called on photographic references to shape his ideas. "I pulled out several images [by still photographers] Bruce Davidson and Nan Goldin, photos with people isolated in their own world, loners, who are very much like the character of Daredevil. We generally kept him in half-light and isolated him compositionally." Partly for that reason, the film was shot in the Super 35mm format. "The way Super 35 allows you to isolate a character in the frame with all that negative space is great," Core attests. "We considered shooting in 1.85:1 because so much of the films world is vertical, but we ultimately decided to go with widescreen for the scale. Because so much of the movie takes place at night, we decided against anamorphic; the stop you can get from Super 35 lenses far surpasses what you can do with anamorphic. In anamorphic, when you light things to a deeper stop, such as T4, the lights that are meant to be the brightest things in the frame  the city lights and window lights  arent the brightest anymore. Theyre competing with the studio lighting. I shot the rooftop scenes at a T2/2.8 split most of the time  which wouldnt have been possible without Michael Weldon, Richard Mosier and Kevin Potter, all amazing focus pullers  and that created a realistic look for the city at night."